Wednesday, the 6th of August 1651. THE House, according to former Order, was resolved into a Grand Committee, upon the Heads of the Bill for an equal Representative in future Parliaments. Mr. Say took the Chair. The Charge of the Forces in England, Ireland, and Scotland, for Seven Months, and Fourteen Days; viz. from the Twenty-fourth of March last, 1650, to the Twentieth of October next, 1651, per Estimation will be as followeth; viz. Pay per mensem. For 30 Weeks. £. s. d. £. s. d. £. s. d.
Toward which there is provided by the Assessments; viz. £. s. d. £. s. d.
Which may charged as followeth; viz. Memorandum, That the above-mentioned 20,000£. lately charged upon the Receipts of Goldsmiths Hall, for the 4,000 Foot, is over and above the Sum of 1,179,727£. 7 s. 6 d.; and is particularly provided for, as aforesaid. 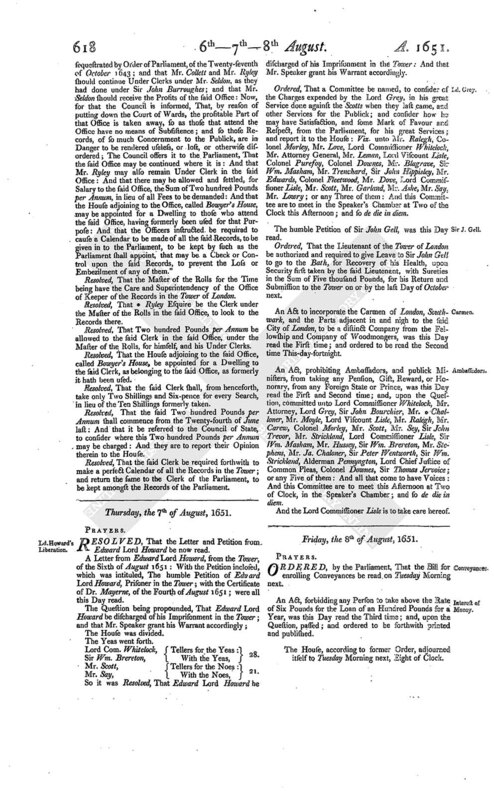 Resolved, by the Parliament, That the Sum of Two hundred thousand Pounds be charged upon the Remainder of the Monies to come in by the Sale of the Fee-farm Rents, after the Monies already charged thereupon by the Parliament, or Council of State, and be appropriated to the Pay of the Forces in England, Ireland, and Scotland, until the Twentieth of October 1651. 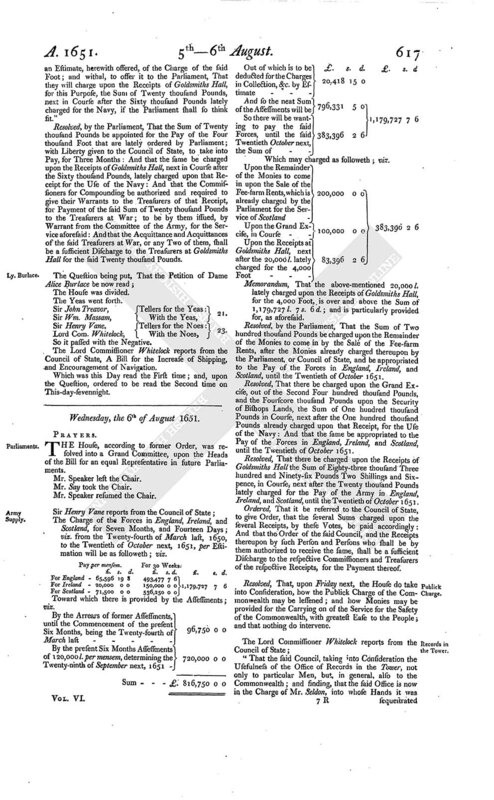 Resolved, That there be charged upon the Grand Excise, out of the Second Four hundred thousand Pounds, and the Fourscore thousand Pounds upon the Security of Bishops Lands, the Sum of One hundred thousand Pounds in Course, next after the One hundred thousand Pounds already charged upon that Receipt, for the Use of the Navy: And that the same be appropriated to the Pay of the Forces in England, Ireland, and Scotland, until the Twentieth of October 1651. Resolved, That there be charged upon the Receipts of Goldsmiths Hall the Sum of Eighty-three thousand Three hundred and Ninety-six Pounds Two Shillings and Sixpence, in Course, next after the Twenty thousand Pounds lately charged for the Pay of the Army in England, Ireland, and Scotland, until the Twentieth of October 1651. Ordered, That it be referred to the Council of State, to give Order, that the several Sums charged upon the several Receipts, by these Votes, be paid accordingly: And that the Order of the said Council, and the Receipts thereupon by such Person and Persons who shall be by them authorized to receive the same, shall be a sufficient Discharge to the respective Commissioners and Treasurers of the respective Receipts, for the Payment thereof. Resolved, That, upon Friday next, the House do take into Consideration, how the Publick Charge of the Commonwealth may be lessened; and how Monies may be provided for the Carrying on of the Service for the Safety of the Commonwealth, with greatest Ease to the People; and that nothing do intervene. "That the said Council, taking into Consideration the Usefulness of the Office of Records in the Tower, not only to particular Men, but, in general, also to the Commonwealth; and finding, that the said Office is now in the Charge of Mr. Seldon, into whose Hands it was sequestrated by Order of Parliament, of the Twenty-seventh of October 1643; and that Mr. Collett and Mr. Ryley should continue Under Clerks under Mr. Seldon, as they had done under Sir John Burroughes; and that Mr. Seldon should receive the Profits of the said Office: Now, for that the Council is informed, That, by reason of putting down the Court of Wards, the profitable Part of that Office is taken away, so as those that attend the Office have no means of Subsistence; and so those Records, of so much Concernment to the Publick, are in Danger to be rendered useless, or lost, or otherwise disordered; The Council offers it to the Parliament, That the said Office may be continued where it is: And that Mr. Ryley may also remain Under Clerk in the said Office: And that there may be allowed and settled, for Salary to the said Office, the Sum of Two hundred Pounds per Annum, in lieu of all Fees to be demanded: And that the House adjoining to the Office, called Bowyer's House, may be appointed for a Dwelling to those who attend the said Office, having formerly been used for that Purpose: And that the Officers instructed be required to cause a Calendar to be made of all the said Records, to be given in to the Parliament, to be kept by such as the Parliament shall appoint, that may be a Check or Control upon the said Records, to prevent the Loss or Embezilment of any of them." Resolved, That the Master of the Rolls for the Time being have the Care and Superintendency of the Office of Keeper of the Records in the Tower of London. Resolved, That * Ryley Esquire be the Clerk under the Master of the Rolls in the said Office, to look to the Records there. Resolved, That Two hundred Pounds per Annum be allowed to the said Clerk in the said Office, under the Master of the Rolls, for himself, and his Under Clerks. Resolved, That the House adjoining to the said Office, called Bowyer's House, be appointed for a Dwelling to the said Clerk, as belonging to the said Office, as formerly it hath been used. Resolved, That the said Clerk shall, from henceforth, take only Two Shillings and Six-pence for every Search, in lieu of the Ten Shillings formerly taken. Resolved, That the said Two hundred Pounds per Annum shall commence from the Twenty-fourth of June last: And that it be referred to the Council of State, to consider where this Two hundred Pounds per Annum may be charged: And they are to report their Opinion therein to the House. Resolved, That the said Clerk be required forthwith to make a perfect Calendar of all the Records in the Tower; and return the same to the Clerk of the Parliament, to be kept amongst the Records of the Parliament.